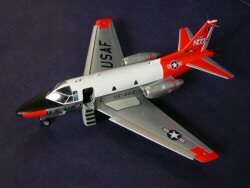 The Collect-Aire T-39 is done by an American maker. I can see immediately his different style of execution as compared to the other makers Collect-Aire employs. This project started some years ago and many friends got involved together in rounding up all the useful info to make this project happen. I am pleased to say that first impressions are good. All the parts were washed in 409 and hot water to get the demolding agents off. The parts were towel dried (no need to air dry - no need to have static free parts - lots of handling to follow anyway). I started with the instrument console as per the instructions. The console was painted using Floquil Black. The photoetch instrument panel parts were removed from their elastic backing and were glued into place. 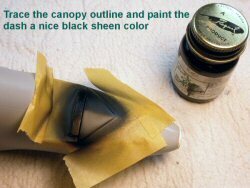 No need to paint them with too many colors because they look neat and because little will show through the vac canopy. The yokes were stolen from another kit because nether of my two Sabreliners included them. I can see the yokes in the instructions but my two kits had none. No big deal. As I said little will show in the end through the clear parts. The interior. Well, this first Sabreliner is going to be an Air Force bird and in my story it had a dark blue carpet and lighter blue seats. I have seen a picture of such a layout but I am not sure how close I am. In the end, when the fuselage is closed up I am sure nothing at all would be visible. Knowing that I did not go overboard with detailing of the interior and just did what made sense. I am sure the maker knew that little or nothing would show and I applaud that he went the extra mile adding all that cool stuff. We are talking here cabinets, stow-able tables, all the seats, water dispensers and the like. Nice! 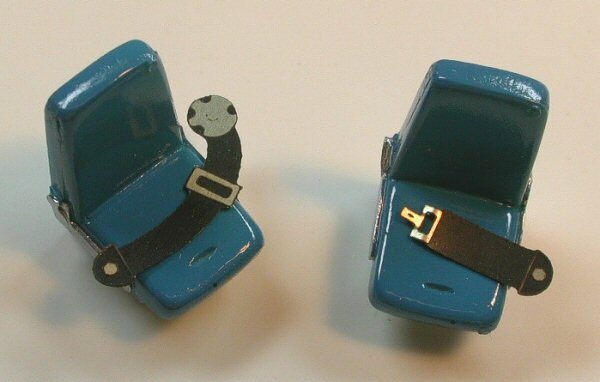 One problem I have is with the provided photo etch seatbelts for the pilots. Just look at the size of those things. Mike was right to make a joke about trying to belt-in King Kong with those mothers! Oh, well, I made my own and saved them for a possible future 32nd scale project! 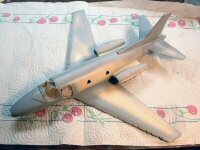 Before the fuselage parts went together I did something that I tried before and it worked well for me. I have bought some clear epoxy from a art and crafts store (Michael's) and I use it when I do not want to fiddle with cutting clear plastic stock to make windows with. This epoxy is dry enough to polish and sand in two days. 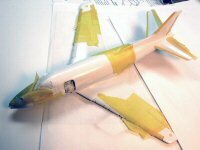 I put high quality Scotch tape on the window openings on the outside of the fuselage. I mixed the clear epoxy, I dropped a glob of it on the inside of the fuselage and forgot about it for two days. 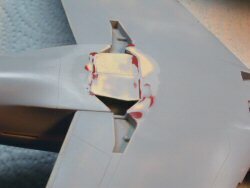 Then I took the tape off and polished the surface of the fuselage with super fine sand paper and the windows look great. Perfectly conforming to the openings, very clear and shinny and indestructible as opposed to clear plastic stock. Don't worry about the blob inside the fuselage. No way it will be visible! The fuselage went together very well. I also added a bunch of lead to help the model stand properly. There is enough space up front for weights. 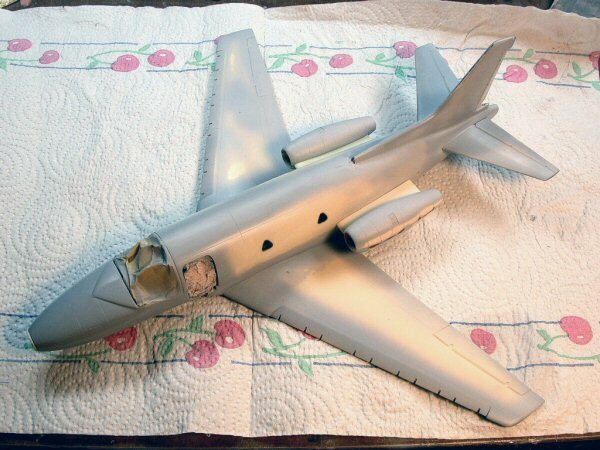 Just in case I Dremeled out a bunch of resin from the rear portion of the fuselage to lighten it up. 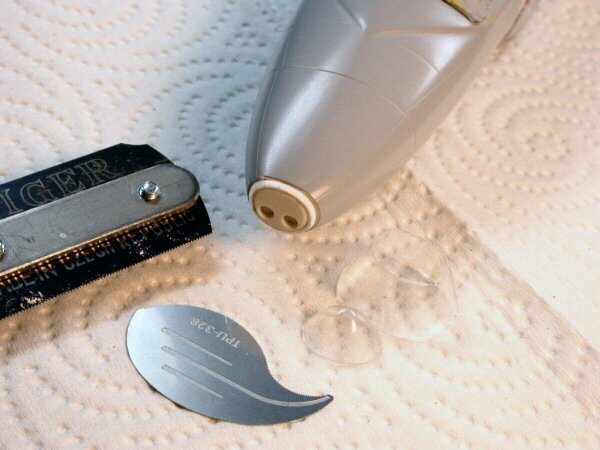 The master was done solid in the back portion and it is very easy to Dremel it out. 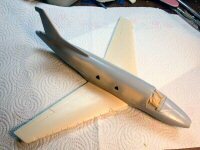 After the super glue on the fuselage was dry I polished off the blemishes and then sprayed Mr. Resin Primer to see where I had issues to fix. Things looked well and little putty was needed. Things were going well so it was time to complicate the scenario! I had decided that my first of the two Sabreliners was going to be a "blind" radar-less bird. This meant that it was going to have a glass nose (actually the bottom part of the nose) to house the landing lights. So out came the razor saw and the nose tip was off in no time. The provided resin light bulkhead part was glued on and the vac nose was test fit with tape. 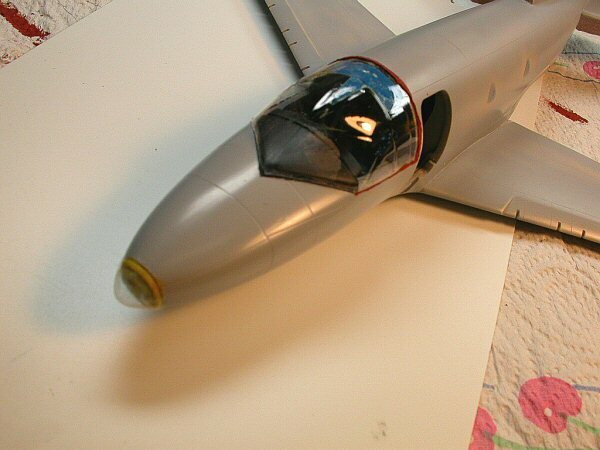 The tip of the vacform nose glazing was scored and removed very carefully with a Trimaster Tritool saw (Hasegawa sells them now - look at Hobby Link Japan for those). The nose tip was tested for accurate fit and was saved in a bag for a later time. The wings went on next and they fit ok with little need for putty. In the next installment we will hang on the rest of the goodies on the aircraft and the we will go to the spray booth for a Mr. Surfacer treatment to see where we missed surface blemishes. This bird will have a white/silver and dayglo paintjob and we have to be careful so that everything is right with the body surface! The T-39 is progressing well. 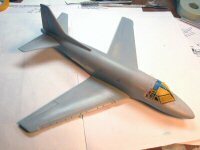 The next step was to check the fit of the engines to the pods and to the fuselage. Very good results indeed. This was important to determine since the plan is to have them off until all the painting is done. It will be much easier painting the white/silver fuselage with its cheat line and day-glo without worrying about the engines and the pylons. Also it will be much easier painting the engines and polishing the intake nacelles and then attach all that to the model. The next step was to flip the fuselage and work on the underside of the model. The inside gear doors are supposed to be up so they have to be glued in place and get in shape. A little work was required here to get them to fit and smooth them out. This was also the time to fix all the molding defects like chipped corners and such. I think I will leave them hanging on my other T-39. After all was smoothed out and looked good, I sprayed the whole area with Mr. Surfacer 500. All was polished up to 3200 level. Then I scribed the areas I had ruined and added the panel lines that were missing and I felt would be necessary for the right look on the undersurface. After scribing was done I continued polishing to 6000 level. The area was done to my satisfaction and I left it alone. Time to flip the model and start working on the "glass". 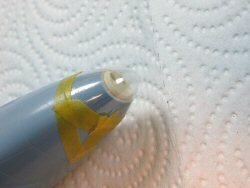 I cut the vac canopy out of its sheet and examined it. It was cleaner than the usual Collect-Aire canopies. I washed it and dipped it in Future for a shinny look. Something did not look right with it though. Of course it did not look right. The maker forgot to scribe the starboard side windows! I looked at my auxiliary canopy as well as the two canopies provided in my other T-39 kit. Sure enough they were all the same. I started thinking that this was the real reason that a general shape canopy was also provided with no scribing at all on it. Apparently, the modeler is given the choice to scribe the whole thing on their own. I intend to just mask the starboard canopy windows off and paint over them. I know it will not look right since there will be no framing present. Also the scribing of the top windows is not very symmetrical. I wonder why things had to be pressed into production half baked. 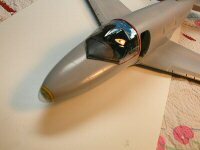 In any case, I test fitted the canopy to the fuselage and it fit ok. The next step was to paint the instrument panel deck area in a nice satin sheen black color. My last jar of Floquil black came out (am I ever sad to see this line of paints gone) and after tracing the canopy contact lines, I masked the airframe off and airbrushed the paint. While the black paint was drying I superglued the provided photo-etch panel to the top of the vac canopy and let it dry. I turned my attention to the clear nose vac piece next. It was washed, dried and dipped in Future. 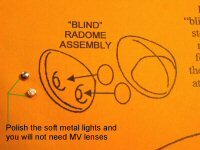 The landing lights were originally intended to be done with MV lenses. 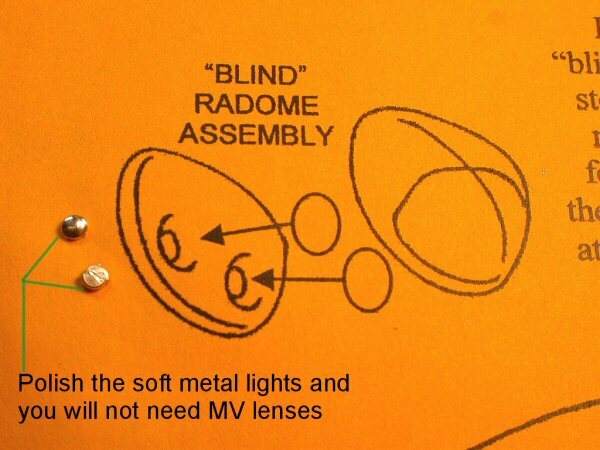 On second look I decide to experiment with polishing the soft metal light representations included in the kit. They are not round due to the molding process so you have to sand them to shape. I then polished them with nail polishing files and got the soft metal to look really shinny. 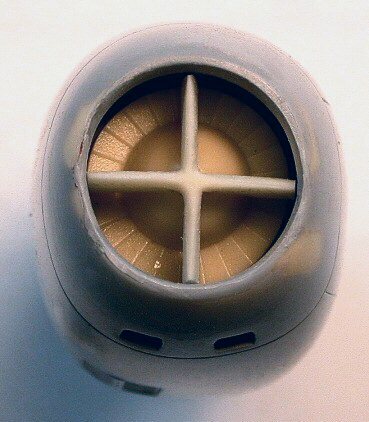 The lights were inserted in their recesses and the vac nose was glued on. The vac canopy was super glued in place and 3M Acryl red was used to hide the small seams left behind. At this point it looks like the airframe is shaping up good and aside of the canopy omission it appears that things should work out well. Time to leave the airframe behind and spend some time on the engines. 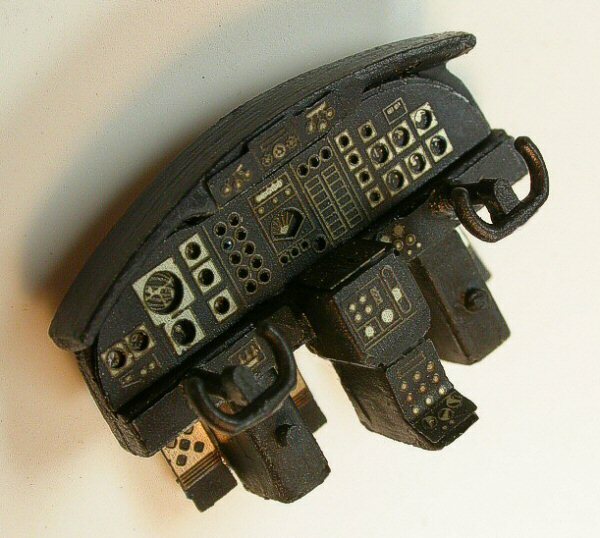 The instructions tell the modeler to insert the jet faceplates and the four way splitters before joining the left/right side pod pieces. Not a real problem if you do not mind the seams showing on the inside of the intakes. I made a decision to level the internal parts off and work on smoothing out the intakes to get that seamless look. One more time 3M acryl red was used, sanded and polished after using Mr. Surfacer 500. 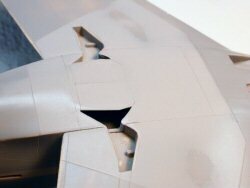 Next, I had to reduce the diameter of the jet fanblade piece as well as the width of the splitters so they could fit inside the engine mouth. Not the maker's fault but a result of my choice not to follow the instructions. 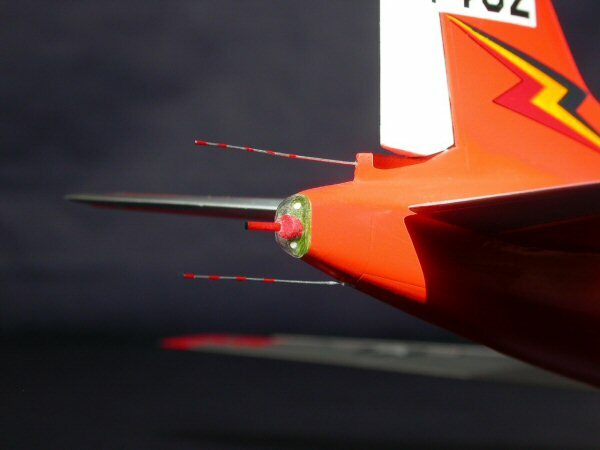 There is a small gap visible when peaking through the engine intake but not of any concern at all. Before we get onto the fun stuff though we have to do the final check on the surface finish. In this build the area that needs the most attention is the area where the vac canopy integrates with the fuselage. Although a lot of planning took place early in the build, I still had to revisit it one more time to ensure that everything was glass smooth. One more very thin layer of Acryl Red went down and was hand rubbed with fine sandpaper and polishing cloths.Then the final layer of Mr.Surfacer1000 went down and was hand rubbed up to 8000 level. I have read that there is a 1500 level of Mr. Surfacer and I need to investigate further because I think it will be great for natural metal jobs. Next, I had to get photographs and the T.O. references out to make sure that the next stage was done correctly. 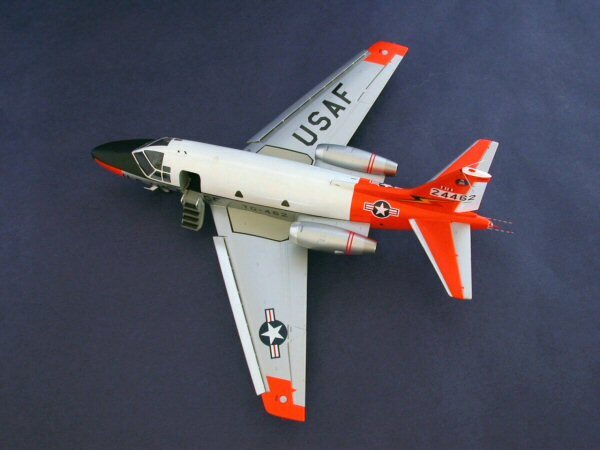 It is important to point the modelers that read this article to some invaluable references available here at Cybermodeler Online.In there I found in all detail all the goods on how to properly paint my T-39. 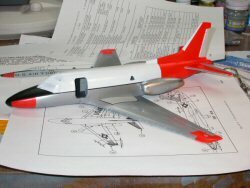 Double that with a photo of the actual T-39 I was planning to do and we were on to the paint shop! It was time to wash the model carefully and prep it for the first layer of gloss white. White is a funny color. It needs lots of attention for it to look right. I always start with a thin coat. I gradually apply more thin coats until it cover the surfaces nicely. I then leave it alone for a day. Then I spray some more in thin layers so I have a nice solid white surface. Then I leave it for at least two more days to dry. Here in Arizona the sun helps with baking the paint. I leave it in a sunny area in the house and the sun does the rest. The next step is to hand rub the white with 8000, and 12000 polishing clothes. It makes a big deal if you want that car model like surface finish. Next, I had to mask out the areas that were supposed to be natural metal, silver painted or dayglo. 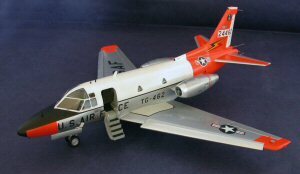 Keep in mind that many or maybe all T-39s with dayglo on the wing tips had the fuel caps left silver. I used my punch & die set and knocked out two circle patches to cover the fuel cap areas with. I then mixed my orange paint and shot it at low pressure nice and wet and at close distance to the model. It was left to dry for a couple of days and the masking tape was left off until later. Now it was time for the Alclad II Dull Aluminum paint portion. I will never stop mentioning how easy and user friendly these paints are. Resin models especially can take Alclad by the bucket since Alclad does not react with resin like plastic might. The white areas of the model were masked again and Alclad II was sprayed at low pressure in many fine coats. Alclad II dries fast and reasonably hard. I have to confess that I like hand rubbing paint to get that deep luster out. Alclad does not need it but I love doing it. 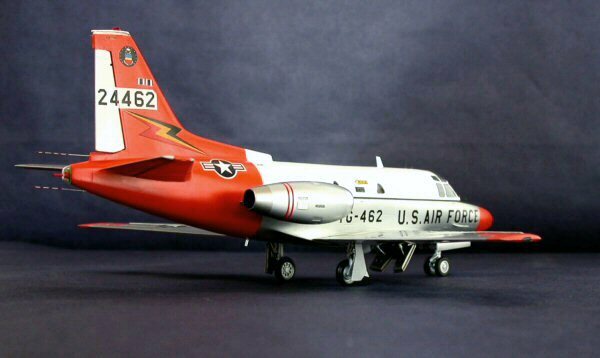 This T-39 is supposed to be just out of the paint shop anyway so why not go the extra mile and get it all shiny and pristine! Two more shades of Alclad II were used, one of Polished Aluminum for the intakes and leading edges and one for the darker tinted exhaust areas. The engine pods are not glued in place at this point and they are just shown for reference. 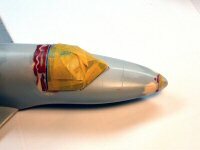 Lastly, I masked the model to prep it for spraying the black areas for the antiglare panel, nose cone and cheat line. As I was laying down the masking tape I noticed that the main cabin windows are molded a bit higher that they should be. The bottom of the main cabin windows should be perfectly aligned with the bottom of the canopy window panels. As the mode is designed the cabin windows are a fraction higher. I would not have noticed it if I were not painting the cheat line. As I was pondering the photographs on the T-39s of that era and especially the one I am modeling I also noticed that the leading edge of the tail should be orange and not natural metal. I need to revisit this area and spray it orange. Alas, I was not done with painting. 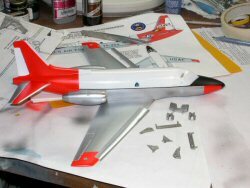 The modeler is to paint the walk areas on the wing tops. I started with outlining the walk areas with masking tape and sprayed them black. The T.O. reference manual mentions 36320 gray for the walkways. In retrospect, I guess I could have painted the walk areas gray and have outlined the with black decal stripes. The rest of the build was rather uneventful. Collect-Aire sent me a small box with pitot tubes, steering yokes, new vacuform sheets (the canopy has all the windows fully scribed now and also the fuel dump clear glazing is also included now). 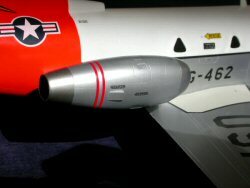 I waited to install the engine pods until the very end so that they would not interfere with decaling. I created the various antennas from very fine wire. The fuel dump area was created by using Evergreen rod for the dump tube. I also fabricated a small conical shape as a base to the tube. Two small clear light were also added in that area. The area was covered with the clear vacuform part that is now included in the kit. I feel that Collect-Aire did very well to include this part as it is not a superficial detail. Windshield wipers were fabricated from wire and Evergreen strip. The clear lights came from the various Cutting Edge clear resin sets. The decals went down well but care had to be exercised since they are very thin and can rip if mishandled. 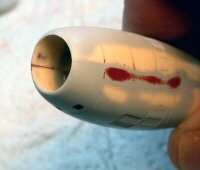 Positive comments go to Collect-Aire for revising and supplementing the vacuform parts as well as including the missing yokes, pitot tubes and overhead instrument panel. 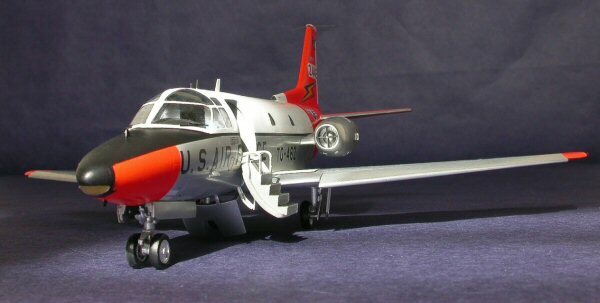 The kit is very much recommended to the experienced modeler that loves the Sabreliner.